Mark V Speed Chart shows recommended speed settings. 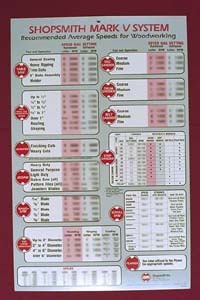 Hang this poster-size chart in a convenient spot and refer to It for ideal RPM settings when using Table Saws, Jointers, Jigsaws, Bandsaws, Sanders, Planers and More. Covers settings for hardwood and softwoods..